We’ve all seen them. The myriad of wonderful, beautiful, exciting, tempting bookish subscription boxes out there. What’s not to love? They combine two of the most joyful things in the world–books and mail. They are also nearly all small businesses that support other small businesses; also a super fantastic thing. I would love to subscribe to one (okay, who are we kidding? I want to subscribe to all of them! ), but they are expensive (between exchange rates and shipping…oh my lanta) and I’m trying to not spend all my money on books because, well, mortgage payments, groceries, insurance. You get it, right? Here are some of the bookish subscription boxes that I’ve seen mentioned on Instagram, Twitter, and Pinterest. There are too many to list in one post, so this one you’re reading is Part One. There will be a Part Two next week and (super exciting!) a Bookish Subscription Boxes for KIDS post next month. All details about these boxes are found on their respective websites. All prices and shipping costs are for the month-to-month option. Many of the services offer three, six, and twelve month prices. I have not been sponsored in any way to talk about them. I just think they are really cool and have had a ton of fun reading all about them and drooling over pictures of what came in each box. Owlcrate was one of the first bookish subscription boxes I discovered. I love how much Korrina and Robert love YA fiction and are not ashamed to be adults who love YA (never be ashamed of what you like to read, friends!). Owlcrate is a monthly themed box with a new YA novel, and three to five bookish goodies, exclusive items from authors and publishers, and a little notey-note about the stuff included. Each month they do their best to keep the contents of the box surprise. Owlcrate costs $29.99 USD plus shipping ($10.59 USD to Canada). Owlcrate’s July 2016 “Good VS Evil” box. Photo by @_forevermint. 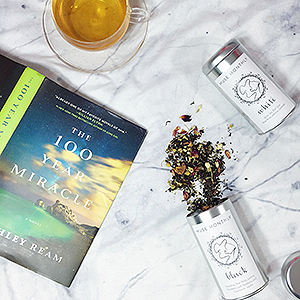 Muse Monthly is a monthly subscription box for book lovers who also love tea. It is beautiful and sleek and simple. Each box comes with a new novel and a full tin of tea. They focus on adult literary fiction, and choose tea that goes with the book in some way. Christina believes in the power and comfort of literature and tea. Muse Monthly costs $29.50 USD plus shipping ($16.00 USD to Canada). Muse Monthly’s June 2016 book and tea. Photo by @musemonthly. Once Upon a Book Club promises to be a unique reading experience. Each box contains a book, a print of a quote, and a collection of two to four wrapped items marked with page numbers. When you finish the page you get to open the item inspired by that page. How fun! Each box also comes with some book club questions marked with dates so you can join an online discussion. Books are newly released and mainly general fiction, women’s fiction or historical fiction. Once Upon a Book Club costs $34.99 USD plus shipping ($14 USD to Canada). Once Upon a Book Club’s September 2016 box. Photo by @onceuponabookclubbox. Authored Adornments has become a staple of my Instagram feed. Julie’s bookish jewelry creations are so pretty and are definitely on my wish list (hint hint for the husband). These boxes are themed surprise boxes and I think only available on month to month from the Etsy shop, not in a subscription model (but I’m putting them in this subscription list anyway, ha!). Each box contains an exclusive Authored Adornments item connected to the theme, and a selection of other goodies like art prints, tea/coffee samples, mugs, throw pillow cases and tote bags. Authored Adornments boxes are $34 USD plus shipping ($16.73 USD to Canada). Uppercase Box is another surprise box for YA books. Each box contains a new hardcover young adult novel. They are all about discovering new books and authors and helping people expand their reading experience. They have a couple of different levels to their subscriptions, the Expert plan for $23 USD per month plus shipping ($22.75 USD to Canada) includes the book (signed or with a signed bookplate), a couple of bookish items, some exclusive content to enhance your reading experience, and a hand-written note. The Book Exclusive plan for $17 USD per month (currently on sale for $13.99) it includes everything in the Expert plan except for the extra bookish items. Uppercase’s August 2016 box. Photo by @lisa_lostinlit. BookCase Club is bookworms surprising other bookworms with books they think they’ll like. Subscribers get two books (woot!) each month based on their chosen theme (young adult, romance, mystery/thriller, children’s, sci-fi/fantasy, paranormal romance). This box only costs $9.99 USD and shipping is a measly $5.00. But, alas, they only ship to the United States. Illumicate is about books and things book lovers will enjoy. It is a quarterly subscription box that delivers fun things every three months. Boxes are delivered in February, May, August, and November. Each Illumicrate includres a newly released book and three to five bookish goodies like bookmarks, jewellery, and stationery. Many items are exclusive to Illumicrate and sourced from independent creators. The boxes ships from the United Kingdom. Boxes are £29.99 GPD plus shipping (between £4.99 – £13.99). Illumicrate’s February 2016 box. Photo by @_halfbl00dprincess. Have you subscribed to any of these boxes? Which is your favourite and why? So that’s $29.99 per month, right? Sigh. There is a way around the US postage problem. At least one company in Great Falls will receive packages and resend them to Canadian addresses. For a fee. Sigh. Sometimes it works out cheaper.